We have an extensive range of folding beds with foam mattress, from lightweight bed frames to robust contract bed frames. All our folding beds have been tested and accredited to achieving British and European safety and quality standards. All mattresses are compliant with British Standard FR Requirements. All frames are guaranteed. 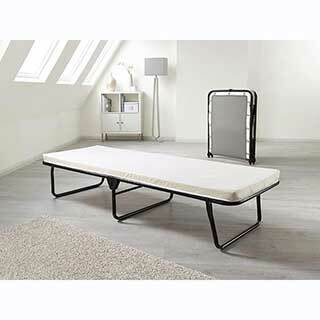 Folding beds are easy to store and can be ready in seconds. Single and double sizes available. Order your folding beds from www.supply2hotels.co.uk. 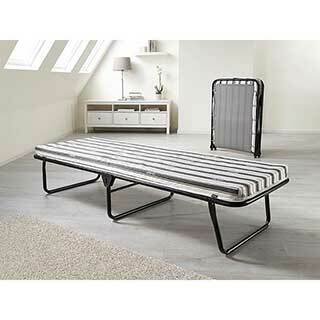 The Jubilee folding bed has a strong and sturdy steel frame, finished in an epoxy paint for long-lasting durability. 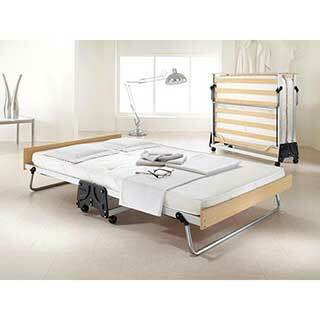 The headboard secures your pillow and 360° castors allow this guest bed to be manoeuvred easily. British made with a lifetime frame guarantee, Suitable for regular use. FSC Certified, supportive sprung slatted base. Breathable Airflow Fibre mattress. Exceeds British and European safety standards. Legs automatically open when unfolded. 360° castors for easy manoeuvrability. Dimensions: Open: W82 x L192 x H39cm (to Headboard 52cm). Folded: W82 x D34 x H100cm. Space under bed when open: 25.5cm. Frame: BS EN 1725. Mattress: BS EN 597-1 - FR requirement. BS EN 597-2 - FR requirement. BS 7177 Domestic - FR. 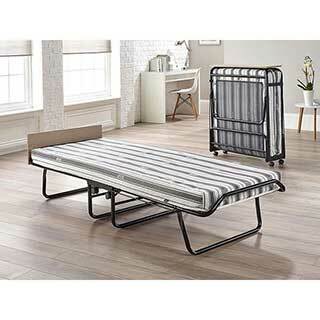 The best folding guest bed available today. 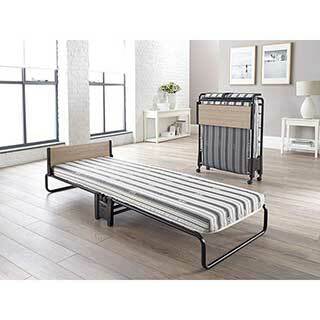 Luxury folding Guest Bed suitable for contract use with Sprung slatted base for extra support. Lightweight anodised alluminium frame, 5 Year frame guarantee. Ideal for Hotels, Guest Houses, etc. Tailored in a high performance fabric for greater durability, the two-metre length mattress combines a top layer of soft fibre with a higher density base layer for exceptional support and comfort. Fully automatic anti-tip folding legs. Full width headboard and footboard. BS EN 1725 - Stability and Durability. BS EN 597-1 - Cigarette FR Requirement. BS EN 579-2 - Flame FR Requirement. BS 6807 Clause 9 (Source 5) FR Requirements. BS 7177 Medium Hazard - FR Requirements. 360* castors for easy mobility. Patented 'J-Lok' mechanism for effortless opening. Dimensions:- Open 204cm long x 96cm wide x 42cm high. Closed 96cm wide x 38cm deep x 112cm high. RRP £399.00. Grey storage cover available. The Royal folding bed combines all the benefits of a compact guest bed with the added luxurious of a pocket sprung mattress. British made with a lifetime frame guarantee. Resting on a sprung slatted base, the pocket sprung mattress has over 400 individual springs, topped with sumptuous fillings which adapt to the shape of your body for exceptional personal comfort. Suitable for regular use. FSC Certified, supportive sprung slatted base. Luxurious Pocket Sprung mattress. Exceeds British and European safety standards. Legs automatically open when unfolded. 360° castors for easy manoeuvrability. Dimensions: Open: W82 x L192 x H39cm (to Headboard 52cm). Folded: W82 x D34 x H100cm. Space under bed when open: 25.5cm. Frame: BS EN 1725. Mattress: BS EN 597-1 - FR requirement. BS EN 597-2 - FR requirement. BS 7177 Domestic - FR requirements. The impression folding guest bed with memory foam mattress gives your guests innovative comfort with the luxury of a memory foam mattress. The memory foam mattress sits on sprung slats, which flex as you move offering adaptable support. The robust steel frame is finished in a high quality durable epoxy paint finish for a long lasting new look. Dimensions - Open: 192cm length x 82cm wide x 42cm high. Closed: 82cm wide x 34cm deep x 100cm high. Mattress thickness: 9cm. Black storaage cover available. RRP £269.99. The J Bed folding guest bed is one of the most luxurious folding guest beds available. It has a lightweight anodised aluminium frame and 360° high quality castors for easy manoeuvrability. The exclusive J-Lok® mechanism enables you to open and close it effortlessly, one side at a time. 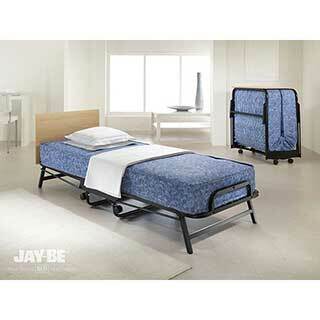 The J Bed has a lifetime frame guarantee and is suitable for regular use in hotels. With a two metre long sprung slatted base and a contemporary mattress combining high density rebound foam with viscoelastic memory foam, this bed provides exceptional comfort. Dimensions - Open: 42cm high x 204cm lengthx 96cm wide. Closed: 112cm high x 96cm wide x 38cm deep. Mattress thickness: 9cm. RRP £499.99. Black storage cover available. Crown Premier folding guest bed with sprung mattress. Specifically designed for regular contract use, the Crown Premier folds out into a comfortable bed with a full size, deep spring interior mattress topped with wool comfort layers. Wool is a natural 'smart' fibre that will continually respond to changes in local humidity. Its natural ability to absorb and release moisture help to keep you and your mattress dry and your body temperature constant. Built with a robust, heavy guage, mild steel construction, and high quality square link mesh base, this bed has a longer lasting durability to withstand the most demanding environments. 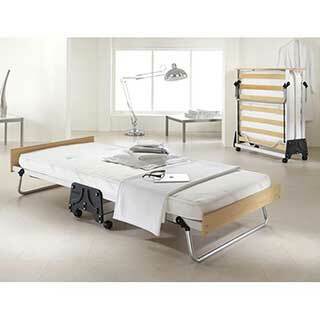 Crown Windermere folding single guest bed with sprung airflow water resistant mattress. Specifically designed for regular contract use and achieves higher British, European and North American safety standards than normal folding beds. The bed features a high quality square link mesh base whilst the mattress is tailored in a highly durable, breathable, antimicrobial, urea and water resistant mattress fabric. Storage cover available as optional extra. 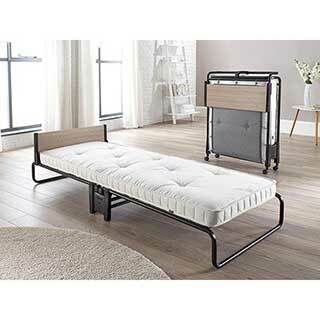 Folding Metal Bed Frame with Sprung Airflow Mattress. Square Ling Mesh Base. Designed for Contract Environments. Manufacturer Lifetime Frame Guarantee. Max Recommended Weight: 150kg, British made by an award winning UK manufacturer. This lightweight and portable bed is the perfect solution for both unexpected guests and regular sleepovers; simply unfold and it’s ready to use in seconds. The breathable Airflow Fibre mattress and J-Tex™ sprung base system support the whole body. British made with a lifetime frame guarantee. J-Tex™ sprung base system for support & comfort. Breathable Airflow Fibre mattress. Durable powder coat paint finish. Exceeds British and European safety standards. Compact design for easy storage. Suitable for regular use. Dimensions: Open: W70 x L186 x H39cm. Folded: W70 x D10 x H93cm. Space under bed when open: 30cm. Also available in double size (4ft). Lightweight, space-saving design and portability makes the Value Folding Bed the perfect solution for establishments with limited space. The compact design when folded means it can be stored just about anywhere. The Memory Foam mattress and J-Tex™ sprung base system support the whole body. British made with a lifetime frame guarantee J-Tex™ sprung base system for support and comfort. Pressure relieving Memory Foam mattress. Dimensions: Open: W70 x L186 x H39cm. Folded: W70 x D10 x H93cm. Space under bed when open: 30cm. Frame: BS EN 1725. Mattress: BS EN 597-1 - FR requirement. BS EN 597-2 - FR requirement. BS 7177 Domestic - FR requirements. 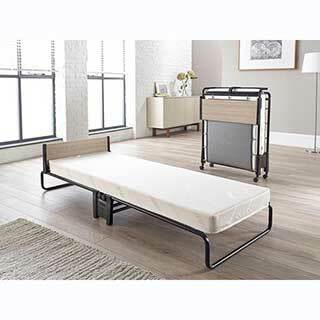 The Advance Folding Bed perfectly combines modern materials with innovative design to offer comfort, durability, and convenience. The breathable Airflow Fibre mattress and J-Tex™ sprung base system support the whole body. British made with a lifetime frame guarantee. Patent pending folding mechanism. J-Tex™ sprung base system for support and comfort. Breathable Airflow Fibre mattress. Exceeds British and European safety standards. 360° castors for easy manoeuvrability. Durable powder coat paint finish. Suitable for regular use. Dimensions: Open: W77 x L200 x H29cm. Folded: W77 x D23 x H101cm. Space under bed when open: 19cm. Frame: BS EN 1725. Mattress: BS EN 597-1 - FR requirement. BS EN 597-2 - FR requirement. BS 7177 Domestic - FR requirements. The Revolution Folding Bed perfectly combines modern materials with innovative design to offer comfort, durability, and convenience. The breathable Airflow Fibre mattress and J-Tex™ sprung base system support the whole body. British made with a lifetime frame guarantee. Patent pending folding mechanism for space saving. Suitable for regular use. J-Tex™ sprung base system for support & comfort. Full width headboard in an Oak effect finish. Breathable Airflow fibre mattress. Exceeds British and European safety standards. Durable powder coat paint finish. 360° castors for easy manoeuvrability. 25 Stone User weight. Dimensions: Open: W77 x L200 x H32cm (to Headboard 48cm). Folded: W77 x D26 x H101cm. Space under bed when open: 19cm. Frame: BS EN 1725. Mattress: BS EN 597-1 - FR requirement. BS EN 597-2 - FR requirement. BS 7177 Domestic - FR requirements. Combined with the J-Tex™ sprung base system, this bed gives full body support. British made with a lifetime frame guarantee Patent pending folding mechanism for space saving. Suitable for regular use. J-Tex™ sprung base system for support & comfort. Full width headboard in an Oak effect finish Luxurious Pocket sprung mattress. Exceeds British and European safety standards. Durable powder coat paint finish. 360° castors for easy manoeuvrabilit. 25 Stone User weight. 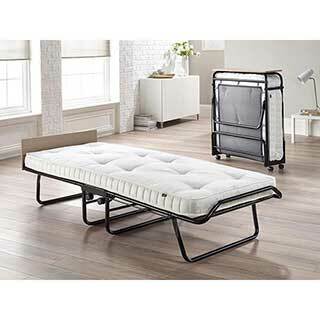 The Revolution Folding Bed with Memory Foam Mattress for full body support. The Memory Foam mattress is made with high density rebound foam and viscoelastic memory foam for optimum pressure relieving comfort. Suspended using high-tension springs, the J-Tex™ sprung base system is extremely strong. British made with a lifetime frame guarantee. Patent pending folding mechanism for space saving. Suitable for regular use. Memory foam mattress. J-Tex™ sprung base system for support & comfort. Full width headboard in an Oak effect finish. Exceeds British and European safety standards. Durable powder coat paint finish. 360° castors for easy manoeuvrability. 25 Stone User weight. Supreme folding bed has a sturdy steel frame and the latest J-Tex™ sprung base system to provide maximum comfort, durability and support. British made with a lifetime frame guarantee. Suitable for regular use. The breathable Airflow Fibre Mattress fillings have a unique open cell structure for ventilation. This ensures that the mattress stays fresh when stored, as well as helping to maintain body temperature during sleep for optimum comfort. J-Tex™ sprung base system for support & comfort. Breathable Airflow Fibre mattress. Exceeds British and European safety standards. Legs automatically open when unfolded. 360° castors for easy manoeuvrability. 25 Stone User weight. Dimensions: Open: W78 x L197 x H40.5cm (to Headboard 51cm). Folded: W78 x D29 x H97cm. Space under bed when open: 25cm. Frame: BS EN 1725. 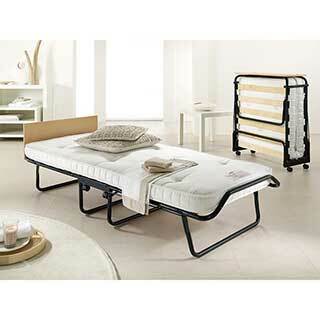 Mattress: BS EN 597-1 - FR requirement. BS EN 597-2 - FR requirement. BS 7177 Domestic - FR requirements. Luxury Pocket Sprung comfort combined with compact design, the Supreme Folding Bed is perfect for unexpected sleepovers and regular visitors. British made with a lifetime frame guarantee. Suitable for regular use. J-Tex™ sprung base system for support & comfort. Luxurious Pocket Sprung mattress. Exceeds British and European safety standards. Legs automatically open when unfolded. 360° castors for easy manoeuvrability. 25 Stone User weight.